3 Beds 2 Baths 1,214 Sq. ft.
Single-level, low-maintenance 3 bedroom, 2 bath home with a 2 car attached garage, and zoned to award winning Riverside schools! Conveniently located in The Reserve at Riverside, this home boasts a bright, open floor plan with a master bedroom on one side of the home and two additional bedrooms on the other side. Located in a cul-de-sac with a low maintenance, level yard. Within 5 minutes of East Riverside Park, Riverside middle and high school, Lowes Foods Grocery Store, Bee Storage and Wine Cellar, and so much more. The architectural roof was just installed in 2017, and the home also features a full irrigation system and security system. 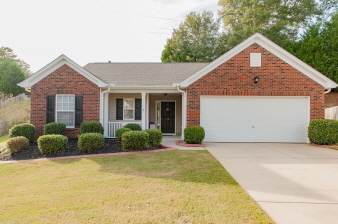 At less than $160,000 this home will not last long. Ideal for all types of buyers - retirees, empty nesters, first time buyers, and investors, just to name a few. Make an appointment to see it today!